Evapco - AXS - Cooling Towers - Factory Assembled - Cooling Tower by Evapco Inc. The Advanced Crossflow Series (AXS) puts a new spin on induced-draft, axial fan, crossflow cooling technology with features designed for simplified maintenance. Crafted from decades of engineering know-how, EVAPCO's AXS cooling towers feature state-of-the-art induced draft, crossflow technology to deliver superior operating advantages in any climate. From performance to maintenance, they simply work smarter. Warm water from the heat source is pumped to the water distribution system at the top of the tower. The water is distributed over the wet deck fill by means of large orifice nozzles. Simultaneously, air is drawn in through the air inlet louvers at the ends of the tower and travels horizontally through the wet deck fill across the water flow. A small portion of the water is evaporated which removes the heat from the remaining water. 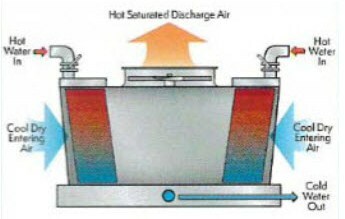 The warm moist air is drawn to the top of the cooling tower by the fan and discharged to the atmosphere. The cooled water drains to the basin at the bottom of the tower and is returned to the heat source. Available with water treatment systems, providing environmentally sensitive alternatives for treating water in evaporative cooled equipment. EVAPCO is a leading provider of commercial HVAC cooling solutions in North America; no matter the environment, EVAPCO has products suited for any situation. EVAPCO’s towers, condensers, and closed circuit coolers offer competitive solutions for needs at all stages of manufacturing in any industry. No reviews were found for Evapco - Model AXS - Cooling Tower. Be the first to review!